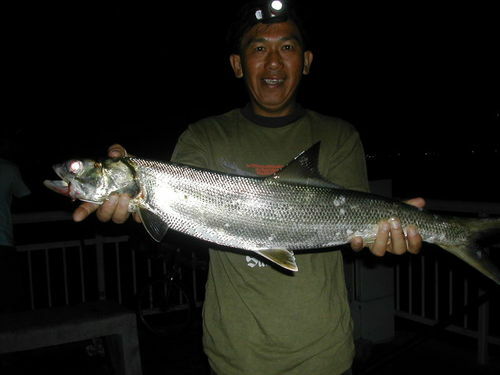 Leng Kia landed this 3kg giant herring when the tide is turning up. It took the bait and the reel screech follow by a acrobatic jump on the water surface. At first Leng Kia thought it was another barracuda as he had caught a smaller one around 1kg plus earlier of the evening. This fish didn’t fought much and it was easily wind back. I grab hold of the line and haul it up the jetty. After photos taking…Leng Kia wanted to release it back into the sea as this fish got alot of bone. I took it and put it on the flooor as I thought of given it to someone who know how to cook it. When the drink seller come along, she saw it and was interested. I joke with her saying how about I exchange this fish with her for three chicken burger. She agreed and the deal is over. At the end, Leng Kia, Roco and me each has a burger to eat for free. I took the photo with the fish on behalf for Leng Kia.